Newport on the Levee was the talk of the town in the late 1990s. It was to be one of the most prominent development projects in the urban core for some time, and transform Newport’s riverfront into a place that would attract tourists year-round. 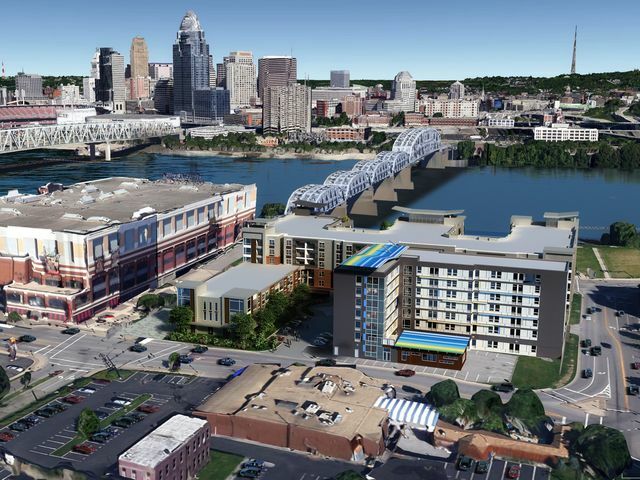 There were also lofty visions that the development of Newport on the Levee would spark a wholesale redevelopment of the Northern Kentucky river city, including virtually every neighboring property and the development of the 1,000-foot-tall Millennium Tower. These ambitions, however, were never fully realized. Newport on the Levee experienced a number a setbacks and never fully embraced the mixed-use nature that would ensure its success, Millennium Tower was cancelled almost as quickly as it was proposed, and while surrounding development has taken place, it has come at a much slower pace than envisioned. Earlier this month developers took the next step forward with a plan to build on the long vacant Lot B next to the Purple People Bridge that would aim to address those issues. According to Capital Investment Group (CIG), the investment would total $80 million and add 238 residential units, 8,000 square feet of street-level retail space, a 150-room hotel and an 800-space parking garage. Newport city officials and CIG representatives say they intend to start construction in July 2015 and wrap-up a year later. While this is good news for Newport on the Levee, it is certainly not when or how developers and city officials had originally envisioned the riverfront development taking shape. In 2000, the plan was for Newport on the Levee to include a mall with a movie theater complex, an aquarium, a state-of-the-art 3-D IMAX theater, and a second phase of development that would begin just two years later and be anchored by a 200-room hotel. Problems arose almost immediately when the 3-D IMAX shut down just two years after it opened in 2001. The retail portions of the mall also never seemed to live up to expectations, perhaps following in Tower Place Mall’s footsteps and illustrating that enclosed shopping malls tend to not work in urban settings. As a result, the mall portion of the development has seen a constant cycle of tenants in and out, and more recently the replacement of most retail inside the mall structure by office tenants. Several restaurant operations have even relocated across the river to The Banks development. The former 456-seat IMAX theater has since been filled by the successful Newport Aquarium. Shortly after the opening of the first phase of work at Newport on the Levee, city officials also pursued the USS Cincinnati submarine in an effort to dock it along the shore of the Ohio River next to Newport on the Levee. Those plans never materialized and now only a portion of the submarine vessel will be returning to the region – at a location in a future phase of Smale Riverfront Park along Cincinnati’s riverfront. During all of this Newport Aquarium has been a particularly bright spot for the development. It is consistently named one of the nation’s best aquariums and is a constant draw for tourists and locals alike – attracting more than 11 million visitors since it opened 15 years ago. With the Great Recession now in the past and new competition from The Banks, Newport officials and developers are looking to jump start things once more. The second phase of Newport on the Levee may be more than a decade behind schedule, but it will add a critical component that was sorely missing from the original development. Full-time residents and a hotel at the site will help drive more business to shops and restaurants operating outside of the typical weekend hours popular for tourists. The revived talk of extending the streetcar system across the river also shows a new sense of collaboration and possibility that did not exist in the lead up to the new millennium. Previous articleWill Main Street Follow in Vine Street’s Footsteps and Return to Two-Way Traffic? Next articleCould Closing the ‘Corporate Inversion’ Loophole Rebuild America’s Infrastructure?